See 4.18.05 - Edge for Private Cloud release notes. Before installing Apigee Edge for Private Cloud, you should be familiar with the overall organization of Edge modules and software components. 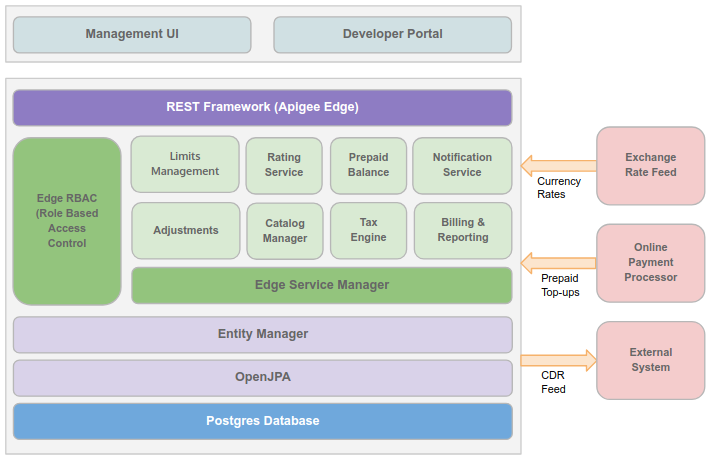 Edge Gateway is the core module of Apigee Edge and is the main tool for managing your APIs. The Gateway UI provides tools for adding and configuring your APIs, setting up bundles of resources, and managing developers and apps. The Gateway offloads many common management concerns from your backend API. When you add an API, you can apply policies for security, rate-limiting, mediation, caching, and other controls. You can also customize the behavior of your API by applying custom scripts, making call outs to third-party APIs, and so on. Edge Gateway is designed so that these may be all installed on a single host or distributed among several hosts. Edge Analytics has powerful API analytics to see long-term usage trends. You can segment your audience by top developers and apps, learn about usage by API method to know where to invest, and create custom reports on business-level information. As data passes through Apigee Edge, several default types of information are collected including URL, IP, user ID for API call information, latency, and error data. You can use policies to add other information, such as headers, query parameters, and portions of a request or response extracted from XML or JSON. All data is pushed to Edge Analytics where it is maintained by the analytics server in the background. Data aggregation tools can be used to compile various built-in or custom reports. Apigee Developer Services portal (or simply, the portal) is a template portal for content and community management. It is based on the open source Drupal project. The default setup allows creating and managing API documentation, forums, and blogs. A built-in test console allows testing of APIs in real time from within the portal. Apart from content management, the portal has various features for community management such as manual/automatic user registration and moderating user comments. Role-Based Access Control (RBAC) model controls the access to features on the the portal. For example, you can enable controls to allow registered user to create forum posts, use test consoles, and so on. The Apigee Edge for Private Cloud deployment script does not include portal deployment. The portal deployment on-premises is supported by its own installation script. If you want to install and configure the portal, contact Apigee Support. Edge Monetization Services is a new powerful extension to Apigee Edge for Private Cloud. As an API provider, you need an easy-to-use and flexible way to monetize your APIs so that you can generate revenue for the use of those APIs. Monetization Services solves those requirements. Using Monetization Services, you can create a variety of rate plans that charge developers for the use of your APIs bundled into packages. The solution offers an extensive degree of flexibility: you can create pre-paid plans, post-paid plans, fixed-fee plans, variable rate plans, freemium plans, plans tailored to specific developers, plans covering groups of developers, and more. In addition, Monetization Services includes reporting and billing facilities. For example, as an API provider, you can get summary or detailed reports on traffic to your API packages for which developers purchased a rate plan. You can also make adjustments to these records as necessary. And you can create billing documents (which include applicable taxes) for the use of your API packages and publish those documents to developers. You can also set limits to help control and monitor the performance of your API packages and allow you to react accordingly, and you can set up automatic notifications for when those limits are approached or reached. 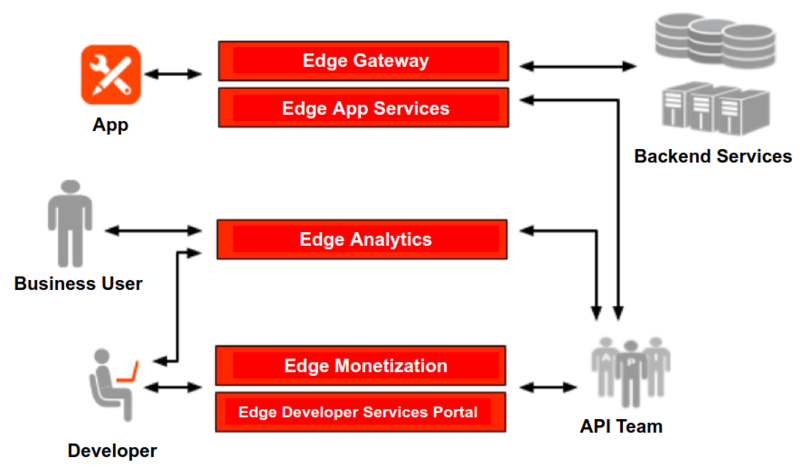 Note: The core Apigee Edge (Gateway and Analytics) is a prerequisite for using Monetization Services. For more information on getting started with Monetization Services using Edge UI, see Get started using monetization. An on-premises installation of core Apigee Edge for Private Cloud (Gateway and Analytics) provides the infrastructure required to run API traffic on behalf of the on-premises client's customers. A Router handles all incoming API traffic from a load balancer, determines the organization and environments for the API proxy that handles the request, balances requests across available Message Processors, and then dispatches the request. The Router terminates the HTTP request, handles the TLS/SSL traffic, and uses the virtual host name, port, and URI to steer requests to the appropriate Message Processor. A Message Processor processes API requests. The Message Processor evaluates an incoming request, executes any Apigee policies, and calls the back-end systems and other systems to retrieve data. Once those responses have been received, the Message Processor formats a response and returns it to the client. 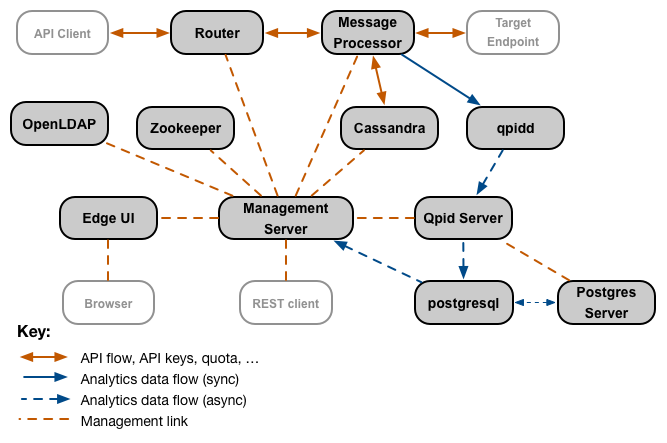 An Apache Cassandra is the runtime data repository that stores application configurations, distributed quota counters, API keys, and OAuth tokens for applications running on the gateway. An Apache ZooKeeper contains configuration data about the location and configuration of the various Apigee components, and notifies the different servers of configuration changes. An OpenLDAP (LDAP) to manage system and organization user and roles. A Management Server to hold these pieces together. The Management Server is the endpoint for Edge Management API requests. It also interacts with the Edge UI. A UI provides browser-based tooling that lets you perform most of the tasks necessary to create, configure, and manage API proxies, API products, apps, and users. A Qpid Server manages queuing system for analytics data. A Postgres Server manages the PostgreSQL analytics database.